This is a guide on installing the latest tensorflow with the latest CUDA library on the latest Ubuntu LTS. The installation is some how straight forward, but there are still traps that I stepped into. The tensorflow homepage only provides prebuilt binary supporting CUDA 9.0, but Nvidia has phased out 9.0 for quite some time. One has to click into the legacy link to download. I hate legacy stuff, so I will build tensorflow from source. Note that the purge command is necessary, otherwise apt refuses to install 396. Device 0: "GeForce GTX 1070 Ti"
Follow the tensorflow official doc, install the python packages. I only have python3. To install bazel, download bazel-0.15.2-installer-linux-x86_64.sh and run it without root. bazel homepage says only 16.04 and 14.04 are supported, but I found it runs fine in my 18.04. Note that tensorflow webpage asks to run sudo pip install. This is wrong. Never sudo pip. Finally, test it with the tensorflow hello world program. Happy machine learning. You are welcome. Go to Google website to download NDK binary for Linux. We only need the repo.prop file to know the exact commit in the source repo. It’s in NDK_DIR/toolchains/llvm/prebuilt/linux-x86_64/repo.prop. This documentation is correct for both NDK r15c and r16. You can manually go to each project directory and do `git checkout <commit>`, where “<commit>” is listed in repo.prop. echo "Warning: $i not found"
echo "Warning: $path not exist"
There are some version mismatches between prebuilts/sdk and soong. //Also take into account object re-use. Singapore parents are very serious on education. Despite that “Every School A Good School”, parents are willing to do 40 hours of voluntary service in order to have a better chance of having their child entering a better primary school. Normally a good primary school has more potential students than the school’s capacity each year. In this case, the school will conduct a ballot to randomly select students to be enrolled. This process is completely open, including the number of students registered and the vacancies. I have done a data visualization on the ratio of students registered vs vacancies for Phase 2C in Google Map. The link of the interactive map is here. The region is divided according to the Voronoi diagram of the locations of primary schools. Reddish region means that there are more registering students than the school’s vacancy. Bluish region means otherwise. Change all PackageManager.getPackageInfo() to PatchSignature.getPackageInfo(). Find out the correct signature. The smali code for PatchSignature can be easily obtained by writing a simple app with the java code and disassemble it. Now we have only one problem remaining, how to obtain the original certificate? I.e. what should we put in new Signature("...")? When taking night sky photography, we need to grab as much light as possible by increasing the ISO, using a larger aperture and/or using a longer shutter speed. However, larger ISO means more noise and there is a limit of aperture size. If the shutter speed is too long, star trails become noticeable. The star trails can be avoided by attaching the camera on a equatorial mount. However, not everyone can afford one. What’s the longest shutter speed without leaving any noticeable trail? Experienced astrophotographers have a good estimation through a trial and error approach. Let’s instead look at the mathematics behind it. Different stars move at different speed. Stars at the poles, e.g. the Polaris, do not move. Stars on the earth equator plane, e.g. the Orion constellation, move the fastest, i.e. about per day. In astronomy, declination ( ) measures the angle of the star above the equator plane. During time , a star at declination moves for an angle of . If (i) a mm lens focuses at infinity, (ii) a star moves for an angle of and (iii) it’s at the center of the picture, then its image on the CCD sensor will move for . The Polaris’ declination is about and the Orion constellation’s declination is around . Putting them together, the star’s image on the CCD will move for mm. For instance, if we use 30s shutter speed and a standard 50mm lens to shoot Orion, the length of the trail will be 0.1mm on the camera CCD. Now, the question is, whether a 0.1mm trail on the CCD is noticeable on the final photo? It’s hard to answer as it depends on several factors: size and resolution of the print, resolution of the sensor and resolving power of the lens. Fortunately, this has been well studied in the optics community. The circle of confusion (CoC) measures the largest blur spot that is indistinguishable from a point. This can be rephrased in our flavour by substituting “largest blur spot” to “longest trail”. A widely used CoC is d/1500, where d is the diagonal of the sensor. For example, for full frame (d= 43mm), CoC = 0.029mm, thus 0.1mm is quite noticeable. I found d/1500 tends to be too large for today’s high resolution camera. Moreover, I usually crop a bit. I’m more comfortable with d/2000. A general rule of thumb is sec where is the 35 mm equivalent focal length. Ideas? Bug report? Please leave comments here. 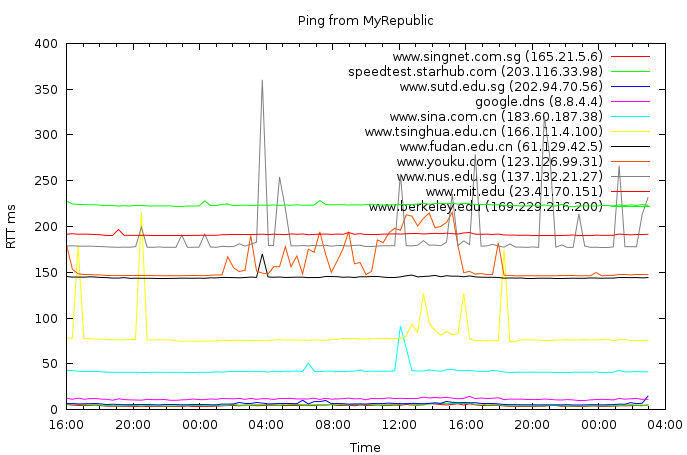 Why NUS-to-MyRepublic latency is so high? I have switched from starhub cable to MyRepublic fibre. I noticed the lag when SSH from home to NUS, so I tried to figure it out. Here is a comparison of the round trip time (RTT) from MyRepublic to various of places I can think of. The measurement spams about one and half days. 5 ping packets is sent to all targets every 20 minutes. Sorry for the limited coloring of the plot. The legend is sorted from low latency on the top to high latency on the bottom. So singnet is the fastest and berkeley is the slowest. NUS, having an average RTT of 189ms, ranks among the slowest three. Here is a summary in the following table. I got geographic location from http://www.iplocation.net. Then I traceroute from MyRepublic to NUS. The route seems OK in the sense that every intermediate host are in Singapore. It’s just the RTT which isn’t right. Could the return route be the problem? Then I traceroute from NUS to MyRepublic. Note that 103.6.151.113 is in MyRepublic. Notice that in hop 10-11, it goes from NUS to coresite.com, which is in California. It then goes to asianetcom.net, which is in Tokyo. Then it comes back to Singapore. Why it routes like that is beyond my knowledge. Besides this, another interesting question is that why google dns is so fast. The distance between Singapore and San Francisco is 13572.66 KM. The RTT of light is 90.5ms, so no one can do better than that. But google can do 11.7ms! It turns out that 8.8.4.4 is an anycast address which means it routes to one of the google DNS servers distributed across the world. Try yourself traceroute to 8.8.4.4! The size of this message is 219 bytes. The sum of all the digits in this message is 125. There are 2 0s, 5 1s, 7 2s, 4 3s, 3 4s, 3 5s, 2 6s, 3 7s, 2 8s and 2 9s. The SHA1 sum of this message has 86 0-bits and 74 1-bits. For more things to read, see here and here.